According to Wikipedia, lagniappe is a small gift given to a customer by a merchant at the time of a purchase, such as a 13th doughnut when buying a dozen. 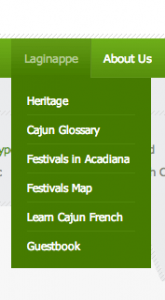 “Lagniappe” is commonly used in South Louisiana, when we’re referring to giving “a little something extra.” On our site, we not only provide you with Cajun recipes, but we also give you information about Cajun culture, festivals around the area, and tips on learning Cajun French. You can access these areas by scrolling up, then hovering over the Lagniappe heading and clicking any of the links.